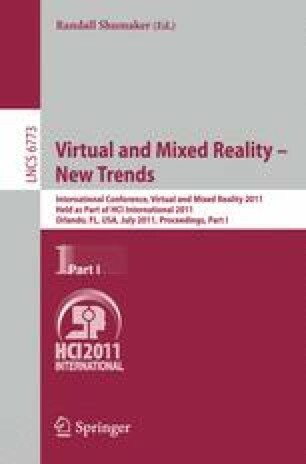 Whole body interaction is an important element in promoting the level of presence and immersion in virtual reality systems. In this paper, we investigate the effect of “grounding” the interaction device to take advantage of the significant passive reaction force feedback sensed throughout the body, and thus in effect realizing the whole body interaction without complicated sensing and feedback apparatus. An experiment was conducted to assess the task performance and level of presence/immersion, as compared to a keyboard input method, using a maze navigation task. The results showed that while the G-Bar did induce significantly higher presence and the task performance (maze completion time and number of wall collisions) was on par with the already familiar keyboard interface. The keyboard user instead had to adjust and learn how to navigate faster and not collide with the wall over time, indicating that the whole body interaction contributed to a better perception of the immediate space. Thus considering the learning rate and the relative unfamiliarity of G-Bar, with sufficient training, G-Bar could accomplish both high presence/immersion and task performance for s.